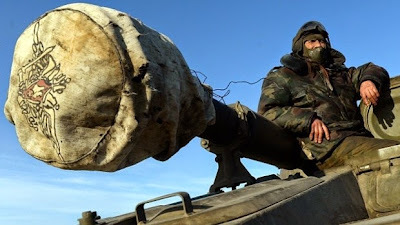 WASHINGTON, DC -- Russia is so desperate to hide its military involvement in Ukraine that it has brought in mobile crematoriums to destroy the bodies of its war dead, say U.S. lawmakers who traveled to the war-torn country this spring. The U.S. and NATO have long maintained that thousands of Russian troops are fighting alongside separatists inside eastern Ukraine, and that the Russian government is obscuring not only the presence but also the deaths of its soldiers there. In March, NATO Deputy Secretary General Alexander Vershbow told a conference, "Russian leaders are less and less able to conceal the fact that Russian soldiers are fighting -- and dying -- in large numbers in eastern Ukraine." Hence the extreme measures to get rid of the evidence. “The Russians are trying to hide their casualties by taking mobile crematoriums with them,” House Armed Services Committee Chairman Mac Thornberry told me. Thornberry said he had seen evidence of the crematoriums from both U.S. and Ukrainian sources. He said he could not disclose details of classified information, but insisted that he believed the reports. “What we have heard from the Ukrainians, they are largely supported by U.S. intelligence and others,” he said. Representative Seth Moulton, a former Marine Corps officer and a Democrat on the Armed Services Committee, was with Thornberry on the Ukraine trip in late March. He tweeted about the mobile crematoriums at the time, but didn’t reveal his sources. He told me this week the information didn’t come just from Ukrainian officials, whose record of providing war intelligence to U.S. lawmakers isn’t stellar. “We heard this from a variety of sources over there, enough that I was confident in the veracity of the information,” Moulton said, also being careful not to disclose classified U.S. intelligence. Both Thornberry and Moulton agreed with Vershbow's assessment that Russian President Vladimir Putin was struggling to keep up the ruse that he has no soldiers fighting inside Ukraine. Moulton said the mounting evidence of dead Russian soldiers is causing a domestic backlash for Putin. Russian and Ukrainian bloggers and activists have been compiling lists of Russian soldiers killed in Ukraine, including details of their service and circumstances of their deaths. New organizations in Russia representing soldiers’ families have sprung up to publicly challenge Putin's narrative. “Russia is clearly having a problem with their home front and the casualties they are taking from the war,” Moulton said. There had been unconfirmed reports of Russia using mobile crematoriums in Ukraine for months, including leaked videos purporting to show them. But never before have U.S. lawmakers confirmed that American officials also believe the claims. The head of Ukraine’s security service, Valentyn Nalyvaichenko, said in January that seven truck-mounted crematoriums crossed into his country over a four-day period. "Each of these crematoriums burns 8-10 bodies per day," he said. The next month, Ukrainian President Petro Poroshenko held up the passports of several Russian soldiers and intelligence officers he said were captured or killed in Ukraine, rejecting the Russian assertions that these troops had accidentally wandered over the border. For many in Washington, the Russian casualties represent a rare vulnerability for Putin -- one that should be exploited through providing weapons to the Ukrainian military. This is a position held by the top U.S. military commander in Europe, General Philip Breedlove, Secretary of State John Kerryand many top lawmakers in both parties. Yet, in the face of European resistance, President Barack Obama said in March that he was still pondering providing defensive arms to Ukraine. More than two months later, he has yet to make a decision. The result has been a de facto policy of limiting U.S. assistance to Kiev to non-military items. Even that assistance has been delivered late, or in many cases not at all. Thornberry said arming the Ukrainians would raise the price Putin pays for his aggression. As long as Putin feels the cost of his Ukraine policy is manageable, Russian fueled instability will continue, he said. The recently passed House version of next year’s national defense authorization act contains explicit authorization for appropriations to support Ukraine’s military and provide it with defensive lethal weapons. This goes further than the action Congress took last year in passing the Ukrainian Freedom Support Act, which Obama signed but still has not acted on with regard to lethal support for Ukraine. The new legislation would set aside money specifically for the arms, and provide for increased production of items the Ukrainians want including Javelin anti-tank missiles. “We’re doing anything we can possibly think of to get at legislatively forcing it to happen. How do we force the president to provide weapons to a country if he doesn’t want to?" Thornberry said. Moulton said that the West has a moral obligation to help the Ukrainians, and under current conditions, the Ukrainian military simply can’t face down the heavy weapons Russia continues to pour into Ukraine. He also said that if Putin isn’t confronted now, he will only become more aggressive later. “When a bear comes out of hibernation, he doesn’t have a few blueberries and go back to sleep. He is hungry for more,” said Moulton. The Obama administration is understandably concerned that giving the Ukrainians arms will fuel the fire and risk a retaliatory Russian escalation. But if that’s the decision, Obama should let the Ukrainians and the American public know it. He then must come up with an alternative to the current, failing approach to stopping Putin’s murderous mischief.